ü Rocks are a type of minerals. ü Rocks are the solid substances that are present in the interior surface of the earth. ü Minerals: Earth composed of various kinds of elements. Mineral has definite composition and a definite atomic structure. ü 98% of earth crust is composed of 8 elements. ü When elements are combined they are called Minerals. ü The basic source of all minerals is magma in the earth. ü When magma cools down the minerals occur in sequence called Rocks. ü Rocks may be hard (granite) or soft (sandstone). ü Rocks may be of different colors. (Gabbro – Black and Quartz – milky white). The rocks are of 3 types depending on their origin, structure or chemical properties. ü When the molten magma cools it becomes solid. ü These are called igneous rocks. 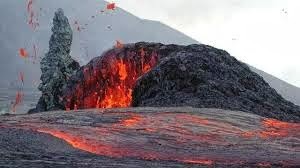 ü The igneous rocks are forming since the formation of the earth. ü These were the first to be formed. ü By erosion the igneous rock becomes sedimentary. ü Due to heat and pressure these are transformed into metamorphic rocks. ü Fossils are not found in the igneous rocks. ü Fossils are the preserved remains or traces of animals, plants and other organisms from the remote past. ü The igneous rocks are of two types. ü When the magma cools and becomes solid in the crust itself then it is intrusive rocks. 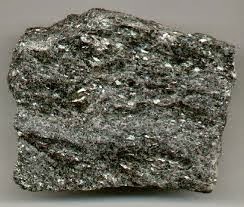 ü The Granite and Dolomite are the examples for intrusive igneous rocks. ü If the magma solidifies after extruding to the surface then it is called extrusive rocks. ü The Basalt rock is an example for extrusive rocks. ü (Note: The Deccan Plateaus are formed by the Basalt rocks). ü The word sedimentary means settling. ü Sometimes because of the external pressures the rocks roll down hit each other and carried away to the different places and are called sediments. 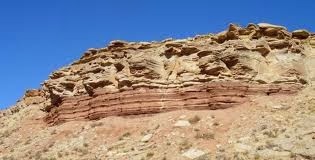 ü When these come together to form a big rock it is called sedimentary rocks. ü These are also called secondary rocks. ü The Sand Stone, Coal and Lime Stone are the example for sedimentary rocks. ü The Himalayan foot hills are formed by the sedimentary rocks. ü The sedimentary rocks occupy 3/4th of the earth’s surface. ü The fossils are found in sedimentary rocks. ü (As we discussed) they are formed form the organic matter derived from the plant or animal remains. ü The oil and petroleum is extracted from the organic matter trapped between the layers of sedimentary rocks. ü Metamorphic means change of form. ü Under great heat and pressure the igneous and sedimentary rocks change to metamorphic rocks.